Lakelse Valley has European history going back to same era as Terrace and Kitsumkalum. Obviously the Native population were there first. Lakelse is the Tsimshian Native language word, for Fesh Water Mussel, found in the Lake and River. the Lakelse Picnic site area, Grouchy's Beach on north end of the lake, are all Government operated facilities. Private operations at Water Lily Bay, still exist, as well as the Mount Layton Hot Springs Resort, which I believe is now closed due to water chlorination issues. Chlorinating a natural hot springs? makes you wonder? This page is a history page, not geared to the new facilities. Lakelse Lake is fed by 13 small creeks. Outflow is the Lakelse River, which flows to the Skeena River. The lake has a maximum depth of 31.7 Mtrs, and a mean depth of 8.5 Mtrs. Its surface area is 1460 Hectares, and the shoreline perimeter is 26.8 KMs. This page covers the lake as well as the valley around it. M. C. Kendall is credited as the First European who discovered the Lakelse Hotsprings. He was a Prospector who travelled from Kitimat Arm to Kitsumkalum on the Skeena River. d- ? ,bef July 1926, Drowned, but I don't know where, Yet! He might have drowned in the Goat River area, Cariboo. Army, Canadian Infantry, 102nd Batt. He had Placer leases that his wife sold after he drowned. and had 7-10 men working all winter on it. Shows as Toulon Mine Superintendent in 1914/15 Mining Report. 1920 There was a Government Fish Hatchery, and Lithia Water, Hot Springs, at Lakelse. 16 miles south of Terrace. 1911 he is shown as a Prospector, cutting trail for road gang. to the Williams Creek Country to prospect there. In 1923 they wrote Ernie Hoult was one of the best known Ranchers and Prospectors in the area. came to the district, ca 1911, from England. congestion on Lakelse Road, and Parking problems, in 1929! was quite a while before printing date. Mount Layton Hot Springs named after Mr. R. B. H. Layton. Mr. Layton lived at it's base, where he had a pre-emption. also in 1919 and 1920 directory as R. B. Layton, small fruit and vegetables. He isn't shown in 1921 Directory or later. For someone this famous, he should be known. b- bet Oct-Dec 1853, age 7 in 1861 census, in Stamford, Lincolnshire. in 1891 his father is shown as a patient in an asylum in Bracebridge, shown married. his occupation was a Piano tuner. and she inherited her dad's meagre estate. arriving in Southampton on the SS Majestic. shown as a draftsman here. He Immigrated in 1907, labourer, not married. age 31 when he married, Asst Supt Government Telegraph. son of Richard Joseph Waugh, Superintendent of US Cable. 1927 directory shows Albert and Alfred Michaud brothers. He was in the Rupert Hospital for a leg injury, prior to his death. Known as a well known Terrace Resident at the time. Came to the Valley in 1908. His cane and hat were found first on the river bank. Relatives in SK and Pincher Creek AB, were thought at the time. while Mr. Gordon went to Seattle on a holiday. Had a son Thomas Turner Jr. in the area as well. A Mr. Albert Cote had a great crop of Tobacco in the Lakelse Valley. Yield 1/2 lb to one plant. This is the first time I have read Tobacco grows here. Ross & Clacker Sawmill operated in the valley. A Mr. Dan Clacker lived at Remo, same guy? J. Kirkpatrick shipped a car load of lumber. d- Jan 26,1920 in Victoria, BC. daughter of James Mann and Mary Maynard. with Mr. Harrison taking over. Granite Creek Hatchery built in 1903 in another article, on Granite Creek, which later was called Hatchery Creek enters the lake 1/2 mile north of Oli's place. Apr 17, 1903, Mr. Thomas Whitwell of Victoria BC, returned from the Skeena River Hatchery, located at Lakelse Lake, on the steamer Danube. He was there for 10 months prior to this date. He was in charge of the hatchery at that time. He reported a severe winter, snow 7 ft 6 in on the ground, Feb 9, 1903. He left Apr 2, 1903 with assistants, Mr. Pretty and Mr. Noble. They had to make 7 portages over ice on the Skeena River. 2 natives were with them, so imagine they were in a canoe. returned to Victoria with Mr. Hall and Mr. Pretty, his assistants, via canoe to Port Essington, going down the Lakelse River, for 10 miles, and 63 miles on the Skeena. It took them 14 1/2 hours, then on the steamer Princess Beatrice. They placed 4 million sockeye eggs that season. A Mr. Herman was also at the hatchery in 1905 (see below) as well as a Mr. Keefer, from the Public Works Dept. who built a better dam on Granite Creek to supply the hatchery with a better supply of water. Only problem was the filtration of the water was poor. Keefer surname is well known in the Dominion Public Works Dept. Hard to tell which one was here. He owned the Caledonia (Caledonian?) Hotel in Port Essington. Shown as a Merchant in the application. He also operated a cannery there. 1903 he ran for the Provincial Liberals and lost. They were selling everything, hotel, cannery equipment. Lots 1 and 2, block 3 at Port Essington. Plus all the houses and cannery at Dundas Island. This was the same company that was buying his canned fish. His 7 year old child, named Peter Alexander Herman also drowned. Peter and his wife had 4 other children. Mr. Hall= Richard Hall? just not sure. The First Hatchery on Granite Creek, at Lakelse Lake, was put out of commission, by a flood in the Fall of 1917. May 1919 plans were announced on building a new Hatchery at a cost of $30,000, at Lakelse Lake. Lieut. Col. F. H. Cunningham Dominion Inspector of Fisheries, made the official announcement. by July 1923 he was Superintendent at the Hatchery, Aug 1923 he was promoted to “Inspector of Fisheries” in Eastern Canada, by the Dominion Government. He had retired in 1957, after 46 years in the Fisheries Dept. showed as divorced when he married Lois. Trade shown as Fish Culture. Very distinguished gentleman by the sounds of it. He lived in Qualicum Bay, single. living in North Battleford SK when he enlisted. Rank LCP. shown as a Car Salesman and Gas Engineer. 1926-1930 I see the name Mr. and Mrs. Charles H. “Charlie” Raven were at the Hatchery. Their original home, and farm, was at Kalum Lake. Charles married Florence Louise Gibbons, Oct 8, 1920, at St. Matthews Church, Terrace BC. He was from a very well off family in Ireland. 3rd Batt., Royal Dublin Fusiliers. so obviously the last Superintendent here. found info that he was the last one to leave, Oct 31, 1936. Flood of 1932 washed their truck away and Granite Creek changed course a bit. When the Hatchery was removed. George Little built a new Government wharf, where the hatchery had a float. Referred to as Hatchery Bay, as it was a sheltered area. info above from: Leona Taylor and Dorothy Mindenhall, “Index of Historical Victoria Newspapers,” Victoria’s Victoria, http://www.victoriasvictoria.ca/, 2007. William's Creek named after him? My guess his name was John Wilkie, a miner who lived in Terrace, Rupert and other places, but he is a mystery photographer. He took many old pictures in Terrace as well. Too bad no initial shown. Wilkie Photo, same era as photo above. per death cert, but in Victoria BC per newspaper at the time. His wife Eliza was related to Lucy Maud Montgomery of Anne of Green Gables fame. so now we have 2 connections in this area, to this one book! J.B. Johnstone shows as owner of Lakelse Hotel in 1918 directory. After he sold his Lakelse Lake Interests, J. B. Johnstone became Foreman at George Little's Mill. He was doing that job, until he left to Victoria, where he died. added 2 new baths in the hotel, and added 2 more row boats, they were previously investors in the hotel. Than the original hotel, which he was turning into a bath house. 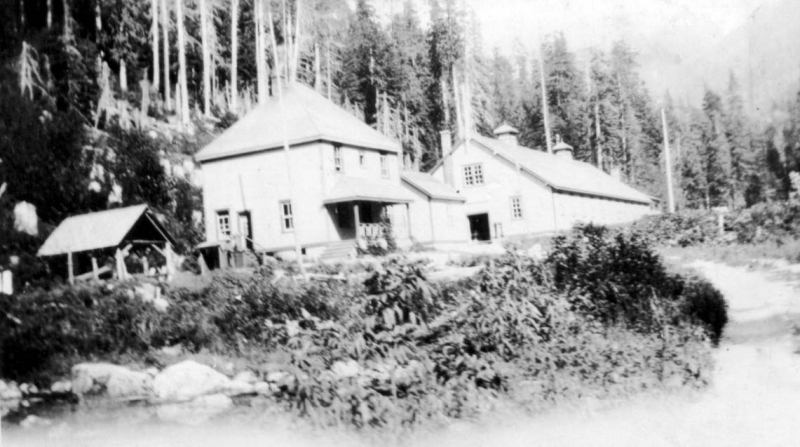 June 10, 1930 a Liquor license was being applied for the Lakelse Hot Springs Hotel, to serve beer, situated at DL 4127, Range 5, Cassiar Dist. Ray Skoglund bought the property and operated it for many years and eventually the BC Government took ownership, and sold it to Bert Orleans from Kitimat at that time. Ray Skoglund took a bulldozer into the property in 1958. One article in 1961, described him as a lean Poker Faced Albertan, who had been a City Policeman, a Mackenzie River Boatman, a logger, and a Construction Man. a 100 ft wide by 200 ft Deep hole lined with fine clay. the clay was used for therapeutic purposes. Lithium, Sulphur free, odorless and pleasant to taste. Nearby where he was building was the remnants of the 14 room Log Hotel built in 1910. This old Hotel had burnt down in 1936. It was built by Bruce Johnstone and Hank Boss. He paid $65,000 for the water rights, and 320 acres of land around the springs. By 1965 the papers were saying it was a $660,000 resort. Outside pool was kept at 85 deg, inside pool at 100 deg. His father was the Manager of the Nicholson Mine, just east of Usk. Oli's Place was the place to go for dancing and dinner, now doing research Oli Kroyer and his assistant, Patrick “Pat” Mahoney had the First Zoo in the North. A Zoo at Lakelse Lake? Adventure Land Zoo is what they called it. Located on 1st Ave next to the lake. at corner of Old Lakelse Lodge Rd. Closed in Oct 1991, the Liquor License was pulled. Local residents signed a petition against strippers at the pub. It has been opened a few times since then as a restaurant. a later census will show him maybe? From what I can find, this started out as a Knox United Church Camp, with a bunkhouse added from the Fish Hatchery. I wouldn't bet the farm on this info, but think it's right. Operated by the Kinsmen Club since 1946 for sure. 1924- 19 boys and girls attended a camp at the lake. Boy Scouts and Cubs have used the Camp. He shows up living in the Lakelse Valley in 1911 Census, so an early settler in the area. living at St. Vincent's Home, 853 Pender St East in Vancouver, when he died. Jan 2, 1934 in Vancouver. same people ? Furlong would have had a Pre-Emption in the area. in 1911 census here. 1930 he was in Usk. and was promoted to Inspector of Fisheries in Eastern Canada. Mount De Boer named after this early settler? my guess is yes. Muller Bay in north end of Lakelse Lake named after him? Maggie Baxter thinks there is a connection with the Dobbie Family and Muller Bay, one day will track that down. she was a widow, age 34 when she married Olaf. shown as Flight Lieutenant R.F.E. Wickham, R.N.A.S. same guy? just a guess at this point. from what I can find he was in Vancouver. now what was a flier doing here? One record shows he joined RFC in 1915.
in as remote a place as this. Edward A. Gruchy in 1908 pre-empted acreage at the lake, age 22. He was the 6th child, of 8, for John and Helen. Nov 27, 1908 Boundary Creek Times reported Joe Hartnett, a young man well known on the coast, was drowned in Lake Lakelse. His Partner W. J. Guiney was able to cling to their boat, till help arrived, but Hartnett got benumbed and sank. Now was Gainey Point, named after Guiney? enlisted in WWI in Victoria, Nov 11, 1914, Reg #77137, 30th Batt. single, fought in S. Africa for 1 year. what they were doing in this area unknown. A Demonstration Orchard set up by the Dominion Government was to be set up at Lakelse and the other at Kitsumkalum, for the north Division of the Province. It was the 5th Official Division at that time. Reported in the Ledge- 1800 lots have been laid out at Lakelse, Hot Springs have been discovered at this point, and a Sanatorium will be erected. Reported in the Ledge, Mr. Rhinehart was experimenting with growing Ginseng in the Lakelse Valley. Hotel Prince Rupert opened mid June 1914 in Prince Rupert, owners George W. Morrow and Harry Brock Rochester. b- Jan 1970 in ON or ? shown age 3 in 1871 census which adds up as well. his hometown is shown as the Dominion Capital, so b- in Ottawa?. Came to Rupert 20 years before he was married, ca 1907. He spent the winter of 1911 in the east. owned by R. Cunningham in Port Essington. for many years, until he became General Manager of the Hotel. In 1927 he was one of the largest shareholders in the hotel. 1927- Director of the Prince Rupert General Hospital. S. D. Johnstone was his best man. She taught school in the Booth Memorial School when she married. We have a mystery in Terrace, with a bottle found, with the Rochester name on it. I know this Harry Rochester above, had a ranch, in the Lakelse Valley area, in Aug. 1931. I have one source that remembers J. C. K. Sealey and Rochester had a bottling works somewhere, but it didn't work out, or last. J. C. K. Sealey was part owner of the Hotel Prince Rupert as well. Sealey also owned almost 1/2 of Hazelton at one time.